Ministers’ wives can find hope and encouragement in this brand new book Sacred Privilege – Your Life and Ministry as a Pastor’s Wife. 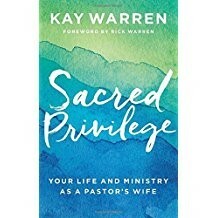 Published in May, 2017 by Baker Publishing Group, Sacred Privilege is already a hit. Author and Bible teacher Kay Warren shares insights drawn from 40 years of experience ranging from church planting to leading international ministries. She and her husband Rick co-founded Saddleback Church in Lake Forest, Calif. The book begins with Warren describing her upbringing as a pastor’s daughter and shares the pressure she felt to be perfect. She very candidly shares “embarrassing secrets” that she struggled with as a teen and young married. She writes with vulnerability about her battle with breast cancer and melanoma and journey of survival through the mental illness and suicide of her son. Warren emphasizes the importance of ministry couples being “in sync” with each other and the importance of “figuring out a rhythm that allows each to flourish and thrive.” She writes, “I’ve noticed one common trait in couples who thrive over the long haul: the ability to see themselves as a team who shares a God-given dream.” Warren goes on to offer ways to actually accomplish that. Your husband isn’t the only one who needs a library. This book should be a part of every minister’s wife’s library. It’s a book that should be kept close, even referred to as a handbook, to help when challenging issues arise and be reminded throughout the seasons that being called as a minister’s wife truly is a Sacred Privilege.